NEW YORK, March 28, 2018 /PRNewswire/ -- Maserati reveals the first Levante built around a V8 engine at the New York International Auto Show. It is the Levante Trofeo, the ultimate Maserati of SUVs, capable of accelerating in style from 0-60 mph in just 3.7 seconds (0-100 km/h in 3.9 seconds) and reaching a top speed of over 187 mph (>300 km/h). "It's proof that when you play with the elements you end up in a storm," says Maserati CEO Tim Kuniskis. "In the case of Trofeo, the engineers and designers in Modena knew that the driveline parameters were more than able to cope with additional power and they also knew that Maserati had access to the finest engines on earth. So, they were up to the challenge of making the finest luxury SUV also one of the fastest." The unmistakable Levante design has reached new levels of sportiness in this top of the line Trofeo. The elegant restyling was mainly focused on the lower front fascia and the rear bumper and is underlined by the 22-inch forged aluminum "Orione" wheels – the largest ever fitted on a Maserati – available in both polished and matte finishes. The side air intakes in the lower fascia feature a new, more aggressive design, defined by two aerodynamic wings that give a sense of further stability, visually "pushing" the weight of the car's nose towards the massive front wheels. And to help improve the airflow distribution, Trofeo is outfitted with carbon fiber side bezel blades and a carbon fiber splitter. Specific details, like the lower splitter, the blade side bezels in the front air intakes, the side skirt inserts and the rear extractor are made of ultralight, high-gloss carbon fiber, giving the Levante Trofeo a polished racing look. Even the hood is new, featuring two aggressive vents for better cylinder head cooling. And under the hood, the engine cover is also made of high-gloss carbon fiber featuring a V8 inscription and the iconic Trident logo, while cylinder heads and intake manifolds are painted red. The ideal 50:50 weight balance and the low center of gravity - common to all Levante models - in combination with the finely tuned double-wishbone front / Multi Link rear suspension and the larger tires fitted to the 22-inch forged aluminum wheels, endow the new Trofeo with remarkably balanced handling and lateral stability. 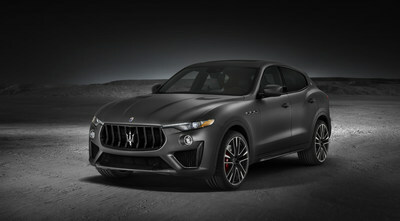 The Levante Trofeo launch edition will be available in eight unique exterior colors including the following exclusive exterior features: 22-inch forged aluminum wheels with three-season performance tires or new 21-inch wheels with all-season tires, in a gloss finish and dark details, like black daylight openings (DLO) and fog light rings, as well as Black Chrome Maserati badges, Trofeo "Saetta" logos, side air vents and trunk accent. The Trofeo launch edition interior is even more individual, featuring natural "Pieno Fiore" leather sport seats available in black, tan or red with contrast stitching. Black leather with blue or yellow stitching is exclusive to the launch edition and all feature the new matte carbon fiber wave interior trim. A serialized badge integrated on the center console featuring the customer's name (or a personalization), has also been added to underline the unique character of the Trofeo launch edition. Maserati produces a full range of unique motor cars immediately recognizable for their extraordinary personality. Thanks to their style, technology and innate exclusivity, they satisfy the most exacting, refined tastes and are a constant point of reference in the automobile industry. The current line-up includes the flagship Quattroporte executive sedan, the Ghibli sports sedan, the Levante "Maserati of SUVs" and the sporty GranTurismo and GranTurismo Convertible. The range has never been more complete, offering V6 and V8 engines, rear- or all-wheel drive, a selection of sophisticated materials and outstanding technical solutions. With its tradition of successful automobiles, Maserati continues to redefine the concept of Italian sports motoring on an ongoing basis through design, performance, comfort, elegance and safety.